Bonjour tout le monde! We’ve had unbelievably good weather (if a bit chilly) since arriving in Paris two weeks ago, but today is rainy, so I’m trading my sneakers for slippers and catching up on the computer. The social media silence is also due to my cell phone situation. Being an old-fashioned and irrational type, I resisted acquiring a European plan for my iPhone, insisting instead on using a dinky Nokia I purchased in London eight years ago. It is not a smart phone — more like a walky talky (or, “talkie-walkie,” as the French would say) — but it inspires great nostalgia and wonder amongst friends and strangers. I have no way to post pictures or pithy comments online in real time, and no Google maps to guide me, but I am alive. Post hoc ergo propter hoc? 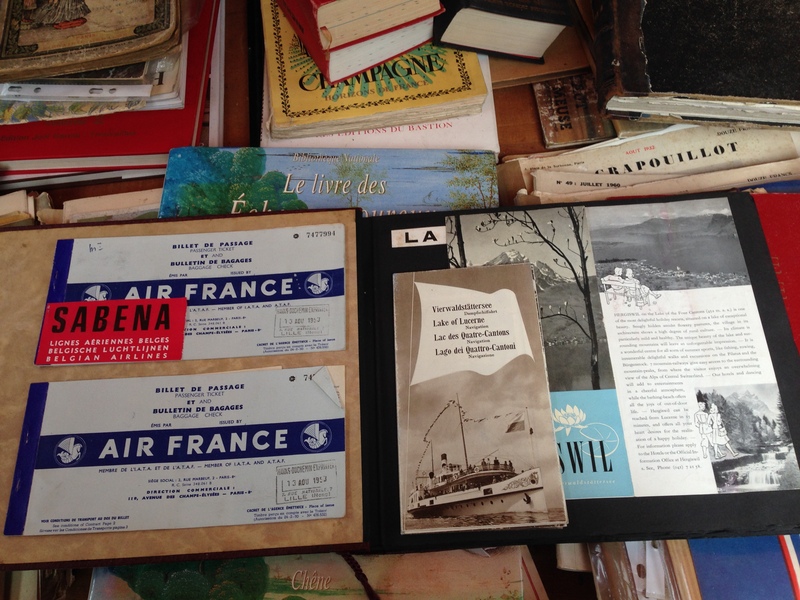 Armed with only an outdated French pocket dictionary care of my grandmother, and a glossy street map from a bookseller friend back home, I set out to find my fortune. It turns out there are many bookstores in Paris. In fact, there are so many, plus les bouquinistes, and markets, that it’s hard to know where to begin. So I took the train to Lille. Once a year, in this town just south of the Belgian border, thousands of vendors and millions of visitors converge for one weekend at “the biggest flea market in the world.” I had read about the Braderie last Friday in the morning newspaper distributed in the metro. My French is pas tres bien, but I understood enough to know it was THE PLACE TO BE. I ran to catch a train from Gare du Nord for the opening on Saturday. The Lilliputians aren’t kidding around. It took an hour to navigate from the Lille Flandres train station to my hotel in the city center; not because I couldn’t access Google maps, but because of the throngs of scouting, peddling, pushing crowds. When I finally parked my belongings in my tiny room with impossible curtains and a stubborn lock, I had to lie down for ten minutes. The U.S. Open was on TV, but the French cameraman had focused at such an angle that the ball was never visible. I gathered my wallet, my phones, and my strength, and ventured outside. The bookstands were few and far between. Literally, there were many kilometers of vendors. I was distracted, respectively, by sizzling waffles, vintage sherpa coats, and Euro-emblazoned underwear, while looking for the main event. I found it on a little side street near the Port de Paris: two professional booksellers, set up back-to-back, far from the madding crowd. Cautious as usual, I didn’t spend hundreds of Euros on the spot, but I took their business cards and promised in my best French to be in touch about a few titles. 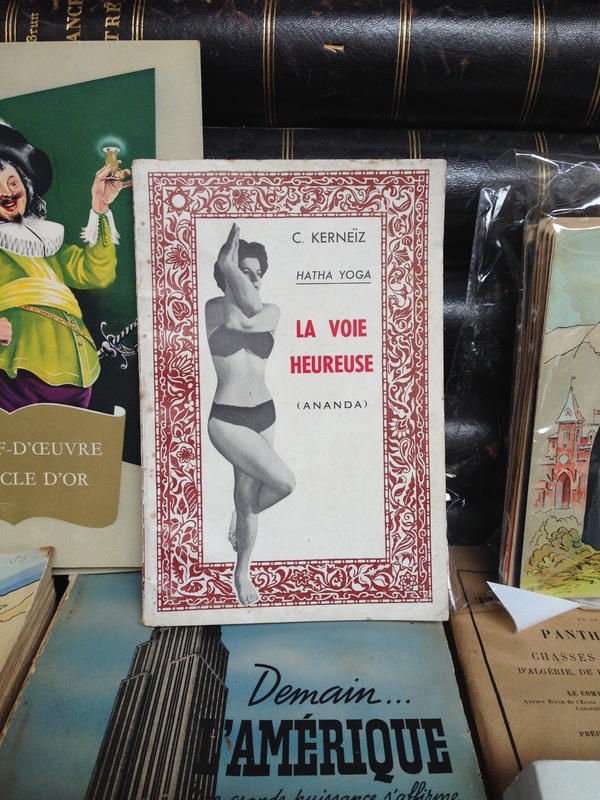 I did buy a book in the designated paper and book showcase lining La Vieille Bourse; I couldn’t resist the cover art on a dictionary of dreams for 5 Euro (interesting subject, too). I also found a stockpile of cartes postales at the stand of a paper dealer near the Parc Jean-Baptiste Lebas. I’ve always loved old pictures, especially black-and-white booklets of postcards with images of locals milling around famous sites. Not the bulky albums with individual cards inserted, but the self-contained, site-specific booklets. On a codicological note, I spotted some intriguing anomalies, including this test (?) spine (left), gilt-stamped all over in multiple directions. More discoveries pictured below. Scrapbook documenting a couple’s trip to Switzerland with their tickets and souvenirs. One of many rebuses punctuating the text of this periodical. 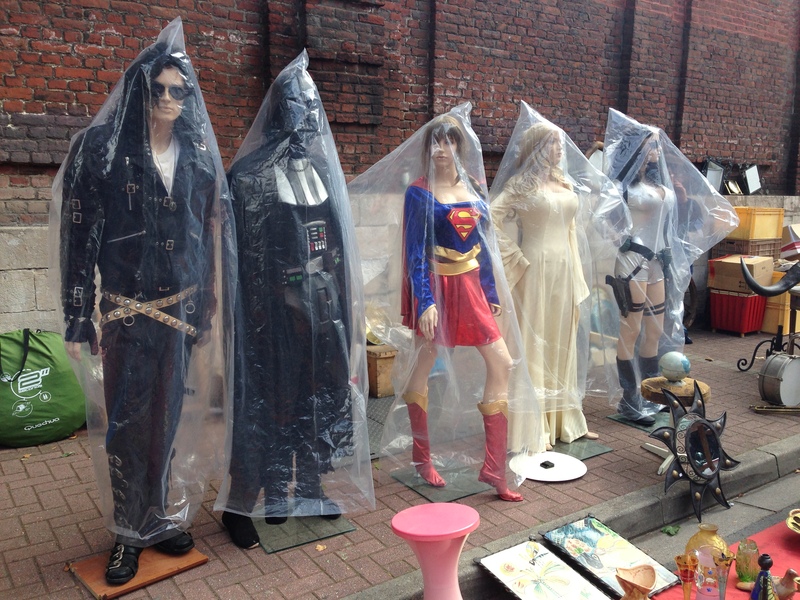 Participants in the Braderie de Lille. 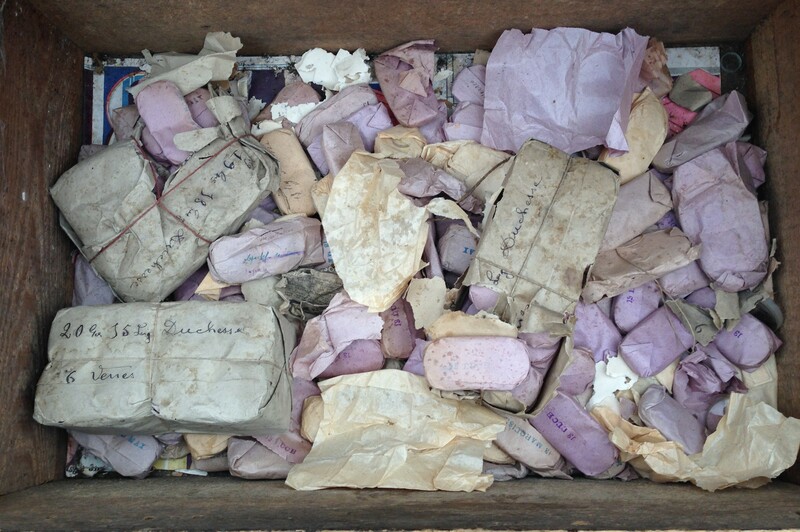 Opera lenses wrapped in hand-dated papers. Back home in Paris, la rentrée means fashion week is soon upon us. Books and Brooklyn are the prevailing themes this year. Le Bon Marché, arbiter of style, issued an entire catalogue of Brooklyn-chic clothing and housewares, including sets of glasses from Fishs Eddy selling at a whopping 45 Euro, if I remember correctly. (The catalogue was an insert in a magazine, which, alas, I have since recycled via the very particular French system of multi-colored garbage bins all destined for the same heap). In fact, the department store is currently holding an entire Brooklyn Rive Gauche sale. Meanwhile, Saint-Germain shop windows are filled with stacks of books and brooding models in loose tweeds. If not for the language barrier, you’d think we were locals, non? 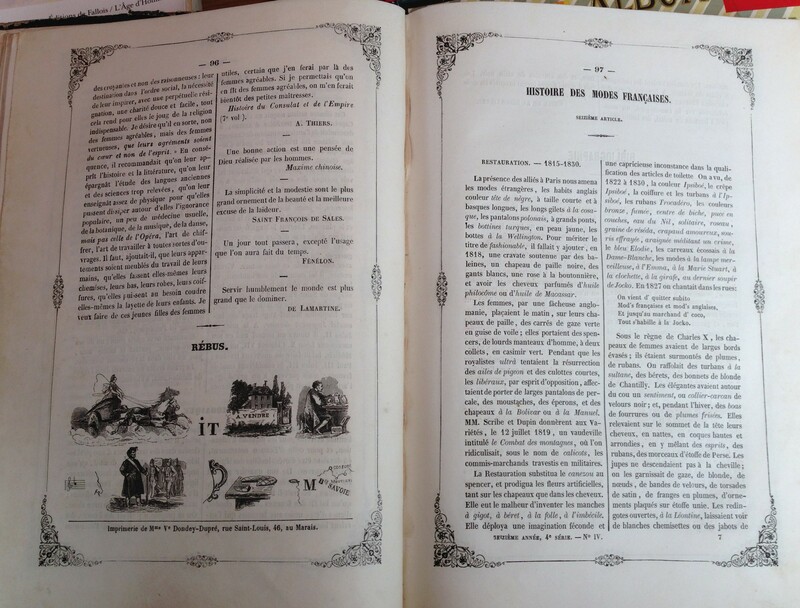 This entry was posted in Books, Flea Markets, Paper, Paris, Travel and tagged Books, Flea Markets, Paper, Paris, Rentree, Travel. Bookmark the permalink. I was just thinking about you an hour ago! Bizarre! That drunken gilt spine is fantastic. Agreed! If only the text were half as good. Partial religious tract, torn and foxed. Ho Zoe, I’ll be sure to raise a toast to you with Stephanie and John next week in Brooklyn!